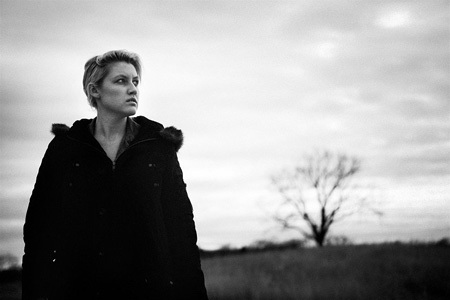 Sarah Jaffe, whose first full-length album was released on Kirtland Records in 2010, has already propelled herself incredibly far with her sweet, strong voice and wise-beyond-her-years songwriting. Her video for “Clementine” has aired on MTV and she has toured with such artists as Norah Jones and Midlake. Her newest album, The Way Sound Leaves a Room, was just released this month. An EP of covers and demos, it showcases Jaffe on numerous instruments she hadn’t tackled before, sounding beautiful as ever. Is there an album or musician that first sparked your desire to write your own music? I remember hearing Patty Griffin’s record Flaming Red when I was 12, and she had a voice that was unlike any voice I’d ever heard. Really deep and soulful. I was already playing the guitar at that age, but I remember being really inspired by her in particular. Who is your desert island artist? Are you most wooed by lyrics, melody, or voice? Voice, most definitely. Good question! What song of your own would you put in a time capsule? “Even Born Again?” Ha…I don’t know…. Maybe “Clementine,” mainly for the irony. What’s one of your best live experiences? I think one of my favorite shows was in Dallas last year. I played The Granada. It was the first show I had ever headlined and sold out. The energy was nuts. That night kind of put things in perspective for me. Just felt overwhelmed with joy to be doing what I loved and to be supported by my hometown so relentlessly. What is your favorite instrument to play at present? I have really enjoyed playing bass. You can be a one-trick pony but still do it smoothly. I like that about the bass. What are three things you always bring on tour with you? What are three things that inspire you? What is something important that you’ve learned over the past year? I should really lighten up. Posted in Music, Music Interviews and tagged Anna-Lynne Williams, Random Truths, Sarah Jaffe. Bookmark the permalink. Trackbacks are closed, but you can post a comment.